One of the joys of traveling is trying local foods and French Polynesia serves up a variety of taste treats - some familiar and others exotic. Whether you plan to visit Tahiti, Moorea, Bora Bora or the Tuamotu Atolls with your family or on a honeymoon, you'll find that savoring the flavors of the islands is one of the must-try activities (although most resorts also offer burgers, salads, pizzas, and pasta for the non-adventurous). Fresh Seafood: A staple of the Tahitian diet, fresh fish - especially tuna, mahi-mahi, grouper, and bonito - is on every menu. You can also try more exotic lagoon and deep-sea offerings such as parrotfish, barracuda, octopus and sea urchin. River prawns, known as chevrettes, are also popular. 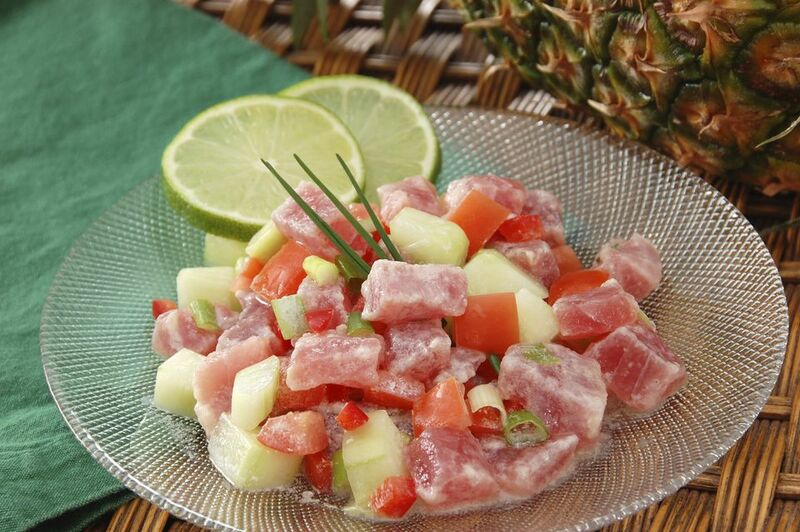 Poisson Cru: Tahiti's national dish, known in French as poisson cru and in Tahitian as ia ota, is a South Pacific twist on ceviche: raw red tuna marinated in a delicious and aromatic blend of lime juice and coconut milk. Hima'a: Every South Pacific culture, from the Fijians to the Maoris, uses an underground oven to prepare a traditional feast. In Tahiti, locals typically prepare their own feasts on Sundays, cooked in baskets woven from banana leaves over hot rocks in a large hole in the ground, called a hima'a. Visitors can experience the hima'a at their resorts during Polynesian Nights. On the menu: chicken fafa (with coconut milk and spinach), fish, suckling pig, shrimp, lobster, banana, breadfruit, taro, and yams. Pineapple: The valleys of lush, green Moorea are famous for their production of small yet sweet and juicy pineapples. You will miss their fresh-picked flavor when you're home. Coconut: Called the "tree of a hundred uses" coconut palms are Tahiti's life source. The islands have plenty of them and Tahitians use every last bit for food and beauty (monoi oil, used for massages and to condition skin and hair, is made from coconut oil infused with tiare blossoms). You'll taste coconut water (great for rehydrating in the hot sun), coconut milk (many foods are marinated in it) and coconut flesh (eaten raw or grated and cooked into everything from sticky coconut rice to sweet coconut bread). Banana: This also locally abundant fruit is eaten in a variety of ways - plain, fire-grilled or sweetened into a taro pudding called po'e. Vanilla: As much as 80 percent of Tahitian vanilla is grown on Taha'a, an island not far from Bora Bora, and the islands' cuisine is chock full of its familiar and soothing flavor. Many fish dishes, such as shrimp and mahi-mahi, come drizzled with mouthwatering vanilla sauce and dessert menus include multiple options with vanilla as an ingredient. Ginger: This aromatic root is also widely used in Tahitian cooking, especially with chicken and tuna; it's also a popular ingredient in cocktails. Breadfruit: Called "uru” in Tahitian, this starchy, vitamin-rich fruit is typically eaten as a side dish after being cooked in a hima'a (underground oven). Yams: These small, sweet purple potatoes are another side dish staple. Taro: Less familiar to most Americans, this plant is valued for both its large, arrow-shaped leaves (called callaloo in the Caribbean) and its starchy root. You'll find taro leaves used in soups and stews, while the root is used to make everything from fried chips to creamy pudding (po'e).